As of 8 p.m. ET on Thursday night, President Trump was finally allowed to reenact his travel ban and continue pursuing his goal of providing “additional scrutiny” to people from six Muslim-majority nations because “the conditions in these countries present heightened threats,” as stated in his March executive order. Or rather, Trump was allowed to enact a heavily modified version of the March directive, which itself was a watered-down version of a January executive order. State Department spokeswoman Heather Nauert defended the new rules on Thursday, saying they assure Americans that they won’t be harmed by foreigners entering the country. But there’s bad news for those Americans who slept a little easier on Thursday night thinking that they were no longer under threat from Iranian fiancés. A short time after the ban went into effect, the betrothed were moved to the “yes” list. “Upon further review, fiancé will now be included as close family members,” a State Department official said in a statement. They did not explain how they came to the last-minute realization that fiancés aren’t a top safety concern. Trump administration officials said they took their definition of close family members from the Immigration and Nationality Act of 1965. But they acknowledged that they added some relations that aren’t included in the statue, like in-laws. Why? Because one of the plaintiffs in the case that led to a federal judge in Hawaii blocking the travel ban wants his Syrian mother-in-law to be able to visit. In Monday’s ruling, the Supreme Court specifically said that she counts as a foreigner who has a “bona fide relationship” with an American. Late on Thursday, the state of Hawaii filed an emergency motion asking the same judge who blocked the travel ban in March to issue an order clarifying that the Trump administration can’t proclaim that relatives such as grandparents, aunts, and uncles don’t count as “bona fide” relations. Another rule that’s expected to generate legal action is the Trump administration’s claim that refugees who have longstanding ties to refugee placement agencies in the U.S. do not have a “bona fide relationship” with a “U.S. entity” — despite the fact that the Supreme Court said something as flimsy as an invitation to speak at a U.S. university should allow a foreigner to bypass the travel ban. “The U.S. government is once again unfairly changing the rules on refugees who, after fleeing for their lives, are now struggling to eat and to stay alive while they try to follow those rules,” Mark Hetfield, president and chief executive of the resettlement agency HIAS told the New York Times. Despite these concerns, compared to the massive airport protests sparked by the original ban, the reaction on Thursday was muted. 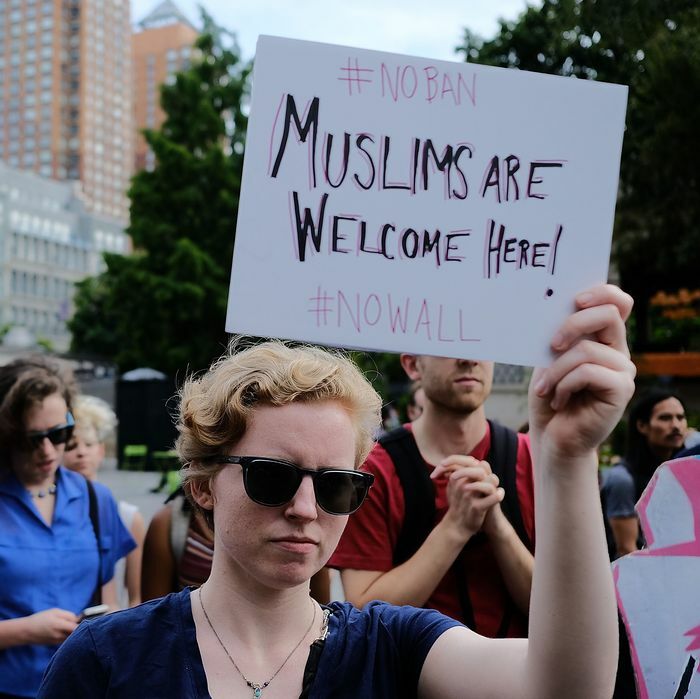 Hundreds protested in New York’s Union Square, but airports across the country only drew immigration attorneys offering free legal advice, and a smattering of demonstrators.